Like all children, I wore what my parents gave me. Unlike most children, my mother was a fashion icon, so I wore lots of high-end clothes and even got to meet and get fashion tips from famous designers. Like all children, I wore what my parents gave me. Unlike most children, my mother was a fashion icon, so I wore lots of high-end clothes and even got to meet and get fashion tips from famous designers. Halston, for example, was (rightfully) horrified by some of my own outfit choices and kindly gave me advice. Not your typical upbringing, I know. My mother once gave me a hand-me-down fur, but even as a child, I just never liked fur, or thought it was beautiful. I've always shared my life with animals, and I have never understood the difference between one of my dogs and a pig, so I don't understand the difference between my dog and a mink. Animals used for fur suffer when they are kept in cramped wire cages and many go mad from the stress. They don't want to be bludgeoned, electrocuted, strangled or drowned. Their skins belong to them and them alone. Mother Nature always looks better in her original state. When people ask me why I don't wear fur, I tell them there's a tremendous amount of bad energy in coats or jackets that are made of the skins of tormented animals. 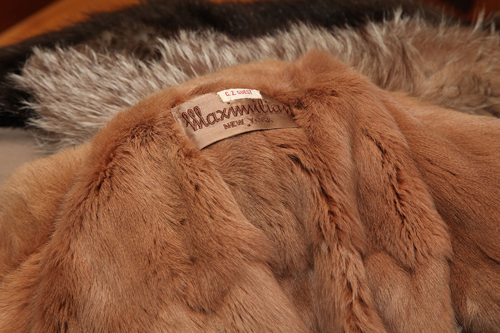 A fur called broadtail, for example, is the skin of fetal or newborn karakul lambs who have been beaten to death. All animals who are killed for fur live and die in misery solely for fashion. I don't lecture, but instead ask people to learn more and gain an understanding of the cruelty and suffering in every fur. At the very least, don't pretend it's not an issue, look into it and then make a conscious decision. I was delighted when PETA asked me to pose for one of its iconic "I'd Rather Go Naked Than Wear Fur" ads because I am passionate about this issue. I know the tides are changing, but you still have to educate in a way to catch people's attention People are so numb to everything, with such horrific things that are considered normal these days. You have to grab the public's attention in a different way, to tell the story and let them know that there are alternatives to cruel products. It's very important to spread the word. And of course you don't have to wear dead animals, there's more fake fur available than ever before. I've recently launched a cruelty-free line of handbags at Bloomingdales and I plan to expand to faux fur for clothes. I've been working with suppliers across the globe to find high-quality eco-friendly materials that are more luxurious than ever. I'm not a snob, I want my bags to be affordable and widely available. Nothing in my collection costs more than $300. There's always an intelligent alternative to cruelty and that includes what we put in our mouths. I am by no means a chef, so when my friends learned I was selling vegan cookies, they thought I finally had gone over the edge. But I've had the last laugh since the cookies are a hit and I'm working to expand on my cruelty-free product line. I'm honored to be working with PETA and felt a weight lift off my shoulders when I donated all my old furs so they can be used for educational campaigns. If I change only one little critter's life, it's a start.